There is a group of people who buy old used wax caps!!! Madness I know, but they are convinced that their Amp, Radio, stereo sounds better with old caps ! I see them buying old used wax caps! Hmmmmm what can you say? OK-I am a "shotgunner" (with old stuff). I don't do this because I don't know how to trouble-shoot, but mostly because I am lazy and would prefer to have things work out of the chute. When I do have to actually THINK to get something working, I like to have a few things already ruled out. One of our forum members just discovered that lack of B+ was due to a shorted P/W cap in the output stage. This was after many weeks of guided trouble-shooting, with all of the predictable side roads. --Checking all coils and transformers and any other non-generic components. --At least sampling the resistors. --If there is evidence of earlier unsuccessful rework, everything gets checked against the schematic. --Replacement of all high-risk parts before power is applied. --Controlled startup with Variac and ammeter. Power is not applied until all of this is done---except that I will do a complete test of the PT if there is evidence of an issue. Using this routine, my success rate is on the order of 98%. The 2% includes the dumb wiring errors, the occasional tube that gets past my minimal tester (see, for example, grid leakage), SMD IFTs, etc. All this said, I'm well aware that shotgunning is not the right approach for everyone. But it works for me. Never try to teach a pig to sing.....it wastes your time, and annoys the pig. Im not sure how their Amps sound when they are on fire though!! Personally, I'd call him or her a grill cook or perhaps a gas station jockey. 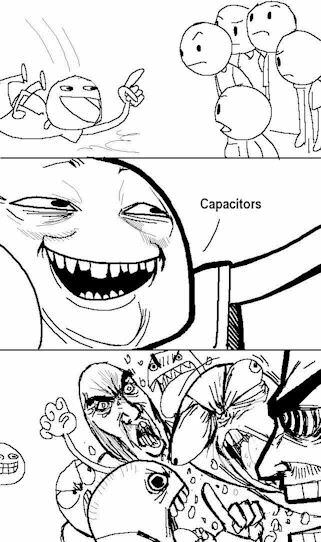 ah the age old fist fight about capacitors (now with more Shango). Shango066 is an interesting fellow, with an interesting and unconventional diagnostic technique. I find his video's very interesting, especially his "resurrection" videos. Basically he takes a piece of junk (often found in the trash) and just gets it to work doing as little as possible. The point of which is to prove that you don't need to "shotgun" parts to get things to work. Heck he powered up a TV (which had been rained on for years) that had several inches of dirt and rat feces in the back of it, and it worked. There was an old GE tube radio that he pulled from a dump where it had sat for over 40 years and it just needed cleaning and a speaker to get it working. Or the old transistor radio that had been exposed to the elements so long the components were bleached white, and he still got it working with only minor repair. it was sent to him and someone just wanted it to work (requested minimal repair). It was something he does not care about. just to see if he can. to troll people who can't stand to see radios not recapped. Many times he powers up old equipment using just a killawatt to monitor amp draw. once again if you see that it's because it is something he is "fixing" purely for entertainment. When he does care about it, he will use a variac or dim bulb. Also he sources parts from old tv's, CFL bulbs, and whatever, once again because what he is working on is not super important. What I learned from him is to stop being afraid to let the smoke out because it is rather difficult to do so, and if it is a cheap piece of equipment who really cares? Even if you do let the smoke out it can still be fixed. TRUE, True, true. Been that way since well before anyone here started, and it'll never change, unfortunately, the trait isn't limited to any one discipline. Certainly a good, well reasoned response. I simply approach it from the other side of the fence, in that it takes quite a bit of time to replace a couple hand fulls of caps, and I want to get it up and running to spec with minimal time and effort. If it requires another session in a few months or years, so be it. Last edited by Mikeinkcmo on Feb Sun 04, 2018 3:38 pm, edited 2 times in total. Are those the same people that think red based tubes sound better ?? A lot of times there's plenty of troubleshooting to still be done after a wholesale cap replacement, especially on sets that got the WWII-era parts shortage repairs! I can understand the minimalist approach, especially if it is to demonstrate troubleshooting techniques; however, there's a difference between "work" and "work reliably". Plus, as these sets age more, we will likely have to pull the chassis again down the road to repair something else. Case in point - silver mica disease. When I first got into the hobby in the early '90s, SMD was a rare phenomena. Now, it's not uncommon to see it in just about any post-war set with small IF cans. It's been a while since I've serviced a set of this era, but the next one that comes across my bench is going to get the mica caps replaced as well. Why? Because the last decade or so have proven that about 60 years, give or take, is the life expectancy of this type of cap and it's not a question of if they will fail, but when. The life expectancy of ceramic disc caps is yet to be determined. There are a lot of sets from the mid '50s onward that have them, so if it turns out to be 60-70 years, we'll find out soon. If that ends up being the case, they will get replaced as well. Otherwise, since they have an established reliability record, they are left unless troubleshooting reveals them to be bad (which has only happened to me once or twice). true, buuuuttt these days, i bet somebody with absolutely no electronics experience could make a decent living doing warranty work by board swapping. they get a minimial amount of training (6 months or so ?) to read a "flow/go-no-go" chart and swap a board for warranty repair. that's what a few young kids in there 20's-30's did for our "high-tech" appliances a dozen or so times over the past 20 years for a warranty house call. i say this with absolutely NO disrespect: i can guarantee these kids did not know the difference between a resistor, capacitor, transistor, IC, diode, or a relay. ohm's law, capacitors/resistors in parallel/series, current, amperage...absolutely no clue, i would bet. each time, they opened their little ruggedized laptop, looked at specific instructions/flow charts, swapped a board, fixed the appliance, and were on their way. again, NO disrespect given in the above statements. I have had good success reforming electrolytic caps with my reformer. I have experienced the flames and bad language fight messages mostly on facebook forums about reforming electro's. I am a long ways from an expert on old radios and repair. I read and try to learn/ keep an open mind on everything. I now just simply stay quiet and go about my business. The sad reality is that NEW equipment, whether it be electronics, washing machines, your coffee maker, or your car ... almost requires board swapping. Most of today's electronics is not designed to be fixed. Case in point .. .the "control module" in my electric hot water tank died. The only way for me to get hot water was to connect the elements directly to the AC supply and then turn it off via circuit breaker when it heated up, until I could get a new board. (turns out that the elements are wired in with sensors that provide feedback to the module so it's not easy to just bypass this stuff ... mechanically) I eventually fixed the old board, but it took days of poking around, then ordering and waiting for the oh so special safety device that had failed. I'm sure the tank will rust out long before I need to use my "repaired" backup module lol. Oh yea, and it cost about half the price of a new tank. Can some modules be fixed? Sure, but as noted, "kids today" have no clue how. And the time it would take a trained technician would usually preclude that based on cost. AND .. a board swap fixes the unit immediately, not in days. I have a few 90s Nec crt's and they all get the same problem where the image goes green in color and than not long after tha they completely loose picture! Well thats exactly what i do! I stick a new main board in and the job is finished in 5 minutes and ths meter never comes out of the tool box! Not worth messing about with the crappy old things. Btw im one of those guys who is only a learner. I have a friend who built a gadget for reforming caps. Works great! I have used it a lot with my HP power supply and usually get caps to reform and they work fine. If they haven't leaked they can be reformed! All those preliminary steps and checks are seldom mentioned. Those preliminary tests get done with every radio. 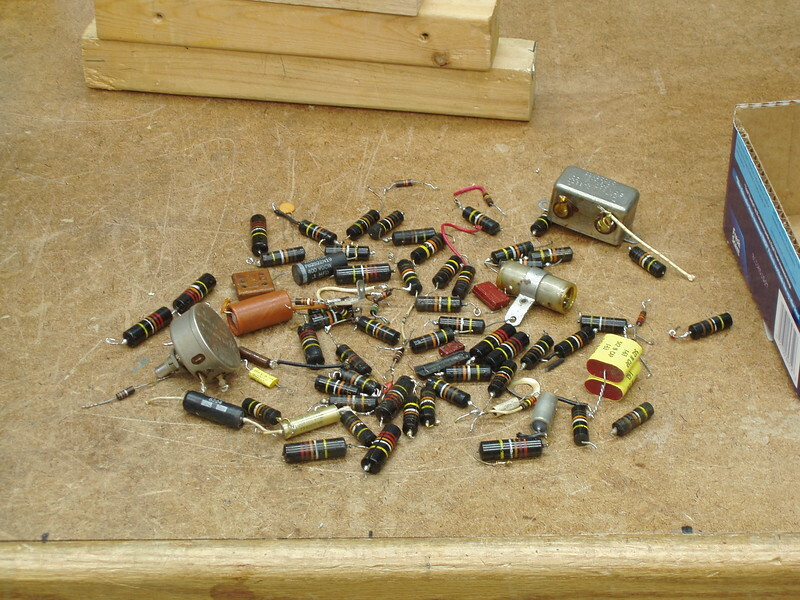 Some radios fail at an early stage, and never get to the point of replacing the capacitors. any further, estimating the cost as best I can without actual powered testing. coils, mechanical assemblies, etc, are NOT included and get priced for parts & labor. in the radio. That covers parts, materials, and labor, so I can give an accurate estimate. Someone mentioned they have a 1970s Receiver that they don't wish to recap because there are so many - keep in mind by that time the waxed paper and foil type capacitor was rarely used. Modern poly film capacitors are very reliable. Electrolytic type capacitors - used in power supply and elsewhere are a different story. It is difficult to impress upon the audio enthusiast what the issues are. It's similar to other appliances or auto repair, nobody wants to spend money they don't have to but without some knowledge of how things work they will always run into trouble. Ignorance isn't necessarily derogatory but "But I told you not to even plug it in!" will not to be appreciated after the sparks fly, they are going to get pissed off at YOU. I see this all the time. Younger people, though not always, will sometimes ask the same question to different technical people (hoping to get a different answer!!) and not liking what they hear. Tube type gear has its issues but I will say it's pretty rugged and durable in terms of abuse. Solid state stuff can be buggered beyond practical repair for the average hobbyist. Younger people, though not always, will sometimes ask the same question to different technical people (hoping to get a different answer!!) and not liking what they hear. I find that far too often. This is just a modern phenomenon, where folks seek guidance on social media. If they don't like the reply, they try different venues until they get the response they want. I replace all of my paper and electrolytic capacitors for a good reason. I've had caps go boom on me because I didn't know I should replace them (first radio/ dumb kid). 2. A radio that doesn't work but has original parts? Manufacturers knew their radios were going to be repaired when they made them. I myself would place more value on a radio that works properly.